Walton Career Services at the Sam M. Walton College of Business hosts events year-round to prepare students for careers. Activities and services include workshops with industry professionals, professional development skill enhancements and internship/job search strategies. 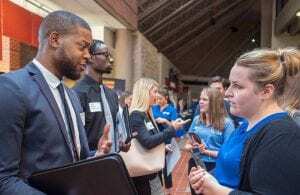 Walton College students find leads for internships and full-time jobs at the Walton College Career Fair. RB Outperformance Challenge: Feb. 7, 9 a.m. – 6 p.m.
Sam’s Club Lunch & Learn: Feb. 11, 11:45 a.m. – 12:45 p.m.
Schneider Corporate Spotlight: Feb. 13, 8:30 a.m. – 12 p.m.
Business Career Fair: March 5, 10 a.m. – 12 p.m. & 1 – 3 p.m.
Enterprise – Company of the Day: March 26, 9 a.m. – 3 p.m.
J.B. Hunt – Company of the Day: April 2, 10 a.m. – 12 p.m. & 1 – 3 p.m.
PepsiCo Distinguished Lecture: April 4, 3:30 p.m. – 4:30 p.m.
Buckle – Company of the Day: April 9, 9 a.m. – 3 p.m.
Careers in the Arts & Entertainment Industries: April 9, 3:30 p.m. – 4:45 p.m.
Academy Sports + Outdoors Corporate Spotlight: April 10, 8:30 a.m. – 1 p.m.
Abbott – Company of the Day: April 16, 9 a.m. – 3 p.m.
SAM Talk with Buster Arnwine of RB: April 17, 2 p.m. – 3 p.m.
For more details, visit walton.uark.edu/career/, email CareerServices@Walton.uark.edu or sign into Handshake uark.joinhandshake.com to see the complete list and newly added events. You can also register to attend at uark.joinhandshake.com.